Is there a meaning to our suffering? Is hope realistic when tragedy befalls us? Is a return to normalcy possible after our life is uprooted by catastrophe? These are the questions that disaster psychologist Dr. Jamie Aten wrestled with when he was diagnosed with Stage IV colon cancer. 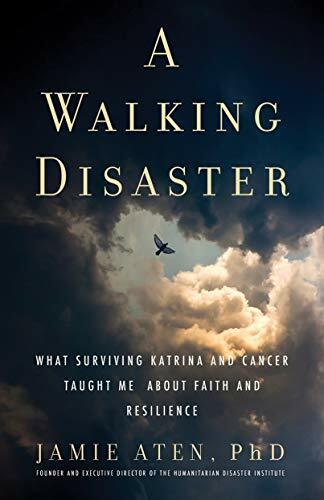 In this gripping memoir, Aten shares the life-affirming and faith-renewing insights that he discovered during his tumultuous struggle against the disease. Aten’s journey began in 2005 when Hur­ricane Katrina struck his community. After witnessing the devastation wrought by the storm, he dedicated his career to investigat­ing how people respond to and recover from all manner of disasters. He studied disaster zones around the globe and founded the Humanitarian Disaster Institute at Wheaton College. His expertise, however, was little comfort when a fateful visit with his oncolo­gist revealed advanced and aggressive cancer. “You’re in for your own personal disaster” was his doctor’s prognosis. Thrust into a battle for his life, with cancer cells and chemotherapy ravaging his body, Aten found his professional interest taking on new meaning. His ordeal taught him firsthand how we can sustain ourselves when burdened with seemingly unbear­able suffering. Some of his counterintuitive insights include: to find hope, be cautious of optimism; when you want help the least is when you need it most; and spiritual surren­der, rather than a passive act, is instead an act of profound courage. A Walking Disaster is ultimately an inspirational story about the power of the human spirit to endure trauma with cour­age.